My mom makes the best kadhi pakora have tasted and I still ask her to prepare it for me whenever I visit her place. I try to replicate her method and get good comments when I make kadhi. It’s simple and always yields satisfying results. 1. For pakora, take besan in a shallow bowl and add ajwain by crushing between your palms. (This way carom seeds release their entire flavor). Add salt and red chilli powder. 2. Add water little by little, mixing, so that no lumps are formed. Add only that much amount of water so that the batter can be easily dropped by hand or a spoon. Beat it well till besan becomes lighter in color. 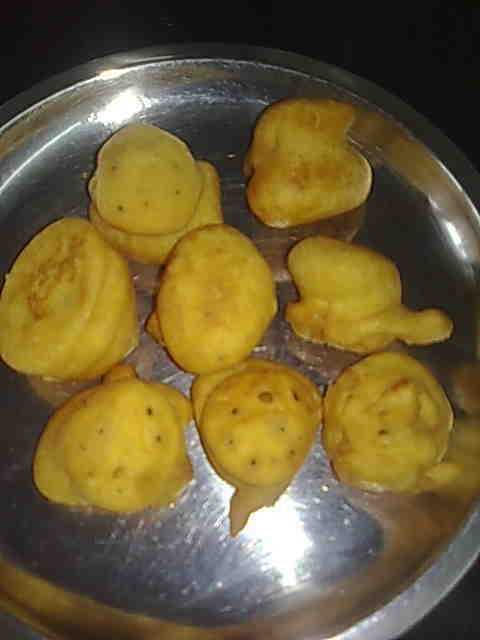 Beating well is important to get light pakora otherwise they will be hard. 3. Heat sufficient oil in a karahi (heavy bottomed vessel). Drop small amounts of batter by your hand or a spoon. Fry on medium heat till they turn reddish brown. Drain on an absorbent paper. 4. 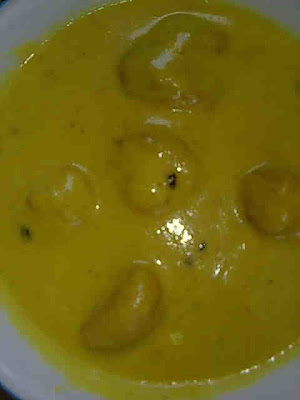 For kadhi, mix together curd, besan, salt, turmeric powder, red chilli powder and 4 cups water. Beat well. You can also mix it with a hand blender or any other blender or food processor. 5. Heat oil in a karahi, add methi dana and cumin seeds. When they change color, add hing. Add ginger and fry for 1 minute. 6. Add curd mixture. Keep stirring till it comes to boil. Lower heat and simmer for about 25 minutes. If it is too thick, add 1 cup water and boil. 7. Add pakoras, give 1 boil and simmer on low heat for 4-5 minutes. Serve hot kadhi pakora with boiled rice.